In November 1918 the armistice ended the First World War. The German army now had to evacuate the Crimea, which they had occupied since the signing of the Treaty of Brest-Litovsk earlier that year. King George V was now becoming extremely worried for the safety of his aunt the Dowager Empress Marie Feodorovna, who was living in the Crimea with her daughters Xenia and Olga, their husbands and children. With the German withdrawal, they would be at the mercy of the approaching Bolsheviks. The King wanted to evacuate them but this was easier said than done because the Dowager Empress did not want to leave Russia. On 16 November the Commander-in-Chief Mediterranean, Vice Admiral the Hon. Sir Somerset Gough-Calthorpe, was told to consider sending a warship to rescue the Imperial party. The mission was entrusted to Commander C E Turle and Lt Commander Korostovzoff, a White Russian officer. They set out with two destroyers, reaching the Crimea on the evening of 20 November. The following day they had an audience with the Dowager Empress at Harax, an English-style house belonging to Grand Duke George Michaelovich. The Dowager Empress refused to leave and in the face of this there was nothing Turle could do. A few days later he returned with Captain Royds bringing newspapers, cigarettes and an offer of hospitality from King Victor Emmanuel III of Italy. The Empress still refused to go and a further visit on 13 December was equally unsuccessful. But by April 1919 the situation had changed. The French had evacuated the Crimea and the Bolsheviks were closing in. On 6 April the Admiralty warned the Rear Admiral of the Black Sea Fleet to expect imminent orders. The Imperial family were gathered at Harax when Captain Charles Johnson of HMS Marlborough arrived. He stressed the seriousness of the situation and produced instructions to evacuate the family that very evening. He also brought the Empress an offer of asylum from King George V and a letter from Queen Alexandra, begging her sister to leave while there was still time. After much persuasion she consented to go. On one condition. The British must evacuate the rest of the family, her retainers and the scores of refugees who were in danger from the Bolsheviks. This gave the officers quite a headache and the Marlborough was hastily rearranged to accommodate many more people than originally planned. Meanwhile, the Romanovs’ servants hastily packed the most valuable possessions for loading at Yalta the following day. The Dowager Empress, Xenia and her family boarded HMS Marlborough from the secluded Koreiz cove that evening. After dark they sailed for Yalta, where the ship’s guns covered the port as the evacuation continued for another three days. When the rumour spread that the Dowager Empress was leaving panic set in. People abandoned all their possessions and hurried to the waterfront to try and get on the Allied ships. HMS Marlborough weighed anchor on 11 April 1919. 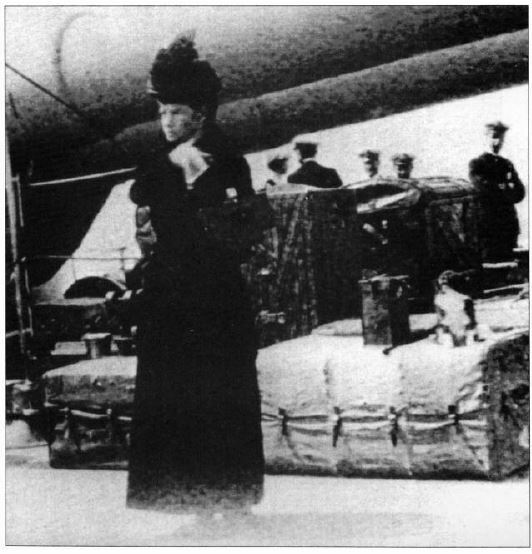 As the Dowager Empress stood silently on deck, tears streaming down her cheeks, a troopship carrying soldiers of the Imperial Guard on their way to fight the Bolsheviks passed close by. When the men spotted the tiny, black-clad figure of the Dowager Empress, the very symbol of Imperial Russia, standing under the White Ensign with the former Commander-in-Chief Grand Duke Nicholas in his Cossack uniform behind her, they began to sing the Russian Imperial Anthem. Late that afternoon as the Marlborough moved silently into the Black Sea the Empress stood on deck, watching the coastline until she could see it no more. As they left the Black Sea and sailed through the Bosphorus, the Empress telegraphed to her sister Alexandra that she was heartbroken. Coryne Hall is the author of Little Mother of Russia: A Biography of Empress Marie Feodorovna and assisted Princess Olga in the writing of Princess Olga, A Wild and Barefoot Romanov. Thank you to Coryne for allowing me to post her article here on Royal Musings. Coryne and I have been good friends for more than 25 years now.